So, a few months ago I decided to make an inspiration board. By "I," I mean I picked out photos and Jake put it together in Photoshop. Thank goodness he is so talented with that because I was using Word. Here is what I came up with. I was lucky enough to get it featured on Style Me Pretty and I was thrilled to have something to take with me to florists and to keep in the back of my head while looking for dresses, invites, etc. I loved it at the time, but I am having color issues and it is impending my ability to get it together. I think about it every time I go on my favorite wedding sites and I see some amazing wedding using all burgundy or navy. I secretly love black, white and yellow but that doesn't fit into my usual shabby chic tastes. The moral of the story is... I am going to stick with this and bring out a little more yellow. 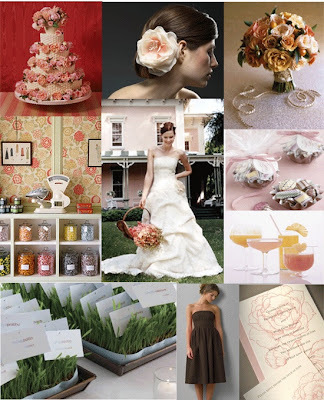 Its all my favorite stuff- the Jennifer Behr hair pin, all the Martha Stewart inspiration, the soft and pretty letterpress. Trust your first instincts, ladies. They are usually right on the money!